Properties in Jungla de Panama Wildlife Refuge average 4.6 out of 5 stars. Property 1: Fully Furnished Two-Bedroom Condo in Boquete! Property 5: Boquete View House! Walk to Downtown! Property 7: Ready for your stay ! In a beautiful mountain setting. View of Volcan Baru. Property 8: Charming Villa in Valle Escondido Resort & Spa! LUXURY VILLA YOLO IN VALLE ESCONDIDO. WALK TO TOWN. Property 11: LUXURY VILLA YOLO IN VALLE ESCONDIDO. WALK TO TOWN. Property 42: COZY CABIN IN THE MOUNTAINS! Casa ubicada a 10 minutos de Bajo Boquete, rodeada de tranquilidad y naturaleza. Property 43: Casa ubicada a 10 minutos de Bajo Boquete, rodeada de tranquilidad y naturaleza. A Place to Discover the Magic of Boquete! Property 50: A Place to Discover the Magic of Boquete! We couldn&rsquo;t have imagined how special our stay with Peter and Sara in Bouquete would be. Our apartment was delightful and equipped with everything we could possibly want. The decor was exquisite. The gardens and grounds were breathless. The 60 plus bird varieties serenaded is beautifully. Our hosts could not have been more helpful. We felt by the end of our stay we had new friends. 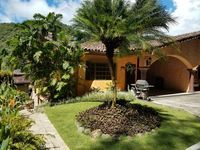 Located in Valle Escondido, Boquete, Panama, this is an extremely good value for an extremely great place to stay. Fully furnished with a fully equipped kitchen, a wonderful king-size bed, a very comfortable living room with multiple recliners. The hosts are very nice and friendly, and can answer just about any question. Highly recommend this villa for any stay in Boquete. Thank you for everything.